If we've learned anything in our travels, it's that the terms "first" and "oldest" are often up for debate when it comes to historic places and events. Sometimes the claims have to be qualified (as in "oldest existing governor's mansion still at its original site") while other times, the boast is the well-meaning exaggeration of a proud community. Either way, there's usually a good story to be found, making our visit well worth the time. A first was what led us to Potter's Tavern in Bridgeton: some contend that New Jersey's first Patriot newspaper was published there. Since we'd already told a similar story about the New Jersey Journal, the Continental Army-endorsed paper founded by Essex County printer Shepard Kollock in 1779, I knew we had to get the scoop. 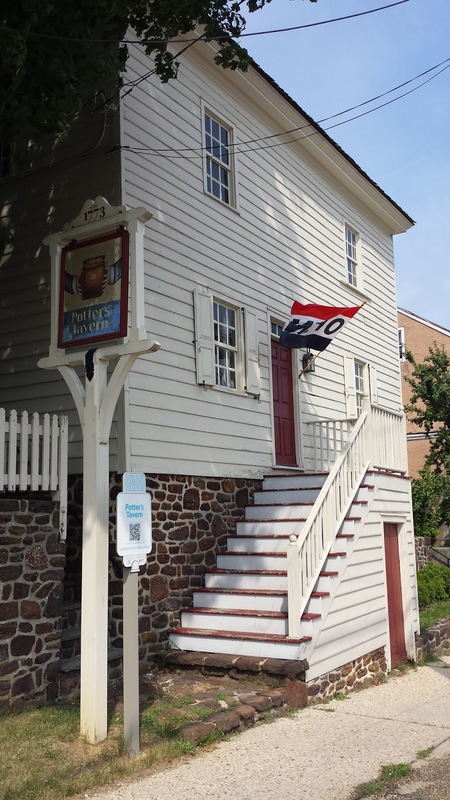 On our first Hidden New Jersey visit to Bridgeton last year, we discovered the city holds the state's largest historic district, an impressive array of 18th and 19th century structures. Potter's Tavern stands prominently on West Broad Street, across from the latest of several successive courthouses to stand in town. While several taverns operated locally in the late 1700s, Potter's was especially popular with lawyers, who would would stop in before or after conducting their business at the courthouse, engaging in discussion of current events. The tavern's contribution to history starts in 1775, several months after the initial battles of the American Revolution were fought in New England. New Jersey soil was untouched by bloodshed at that point, but a small group of Greenwich men had already acted on their displeasure with British rule by conducting their own version of a tea party, burning a shipment of the English import in the community's market square. Others were actively debating the various options of an evolving relationship with Great Britain: maintaining status quo, negotiating with the Crown on issues where colonists had grievances, or continuing the armed battle for independence. Sometime before Christmas of 1775, one of those tea burners and other patrons of Potter's Tavern decided to issue their thoughts in a handwritten document on a weekly basis. Several wrote essays that were then collected and given to a scribe to be penned into one long document that was posted at the tavern. None of the essays was signed; the fact that they were transcribed by one person assured that no particular man's handwriting would betray him for advocating treason and rebellion. Tavern owner Matthew Potter wasn't one of the authors, but he could have been arrested just for allowing his customers to work on the newspaper on his property. More than a dozen issues of the Plain Dealer were published from late 1775 to early 1776, helping to galvanize support for independence from British rule. Though Cumberland County's Loyalists attempted to find the writers and hold them legally accountable for their rebellious words, no-one was ever identified. After the war, several authors came forward, including two future New Jersey governors -- Richard Howell and Joseph Bloomfield -- as well as local physicians Jonathan Elmer and Lewis Howell. Copies of the Plain Dealer are housed in Rutgers University's Special Collections in New Brunswick. The Cumberland County Historical Society opens the tavern to the public a few times a year,* including the day we visited. The smallness of the place seemed about right; you could see how the intimate setting would encourage the regulars to share dangerous ideas. We learned that the Potter family not only operated a food and drink establishment in the building, but lived there, too. The seating area on the first floor was about the size of a small living room, with a cozy fireplace and a barred-in counter where the alcohol was locked up. An authentic colonial kitchen in the back brings visitors back to colonial days. One of the restored rooms upstairs is interpreted as a bedroom, while the other exhibits historic maps of Bridgeton and Cumberland County and a collection of military swords used by Potter men from the Revolution through World War I. All of this brings us back to the original claim and a question: was the Plain Dealer, indeed, New Jersey's first newspaper? The state's now-deceased de facto historian, John Cunningham, felt its regular publication schedule was enough to qualify it as a newspaper, while others say no. I contend that the label we put on it doesn't matter nearly as much as the impact of its existence. Unless another example can be found, it marked the first time New Jerseyans regularly put pen to paper to debate and promote the merits of independence from the British Empire. That's clearly enough to recommend it, and to place Potter's Tavern on the list where Americans risked their freedom to express their heartfelt beliefs. * Those who'd like to arrange a private tour can make arrangements through the Historical Society. Near the center of the Pinelands community of Chatsworth, there's a sandy, partially grass-covered clearing on the side of the road. 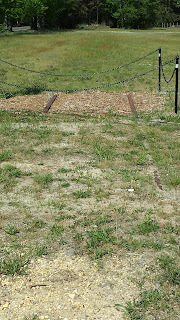 In it, there's a square plot marked off by a decorative black chain, and within the plot, a pair of rails embedded in the ground. Apologies for the bad framing. Photo shot from the car. It's hard to see in the picture, but those rails extend far beyond the clearing, well into the woods in the distance. They mark the remains of Chatsworth's ties to the rise and fall of New Jersey's version of glamorous land travel. Today, the strongest connection any of us have to passenger rail travel is likely to be with New Jersey Transit commuter trains and light rail, but for our earlier neighbors, that wasn't the case. In the first half of the 20th century, particularly before air travel became the norm, trains could be something very special. Long distance travelers could enjoy luxury accommodations on express lines like the 20th Century Limited, and even local commuter trains sometimes sported cars specifically for the first-class set. By the 1920s, Central Railroad of New Jersey President R.B. White saw glamour as a way to attract riders to what had become the company's rather pedestrian, unpopular line to the state's southern shore destinations. 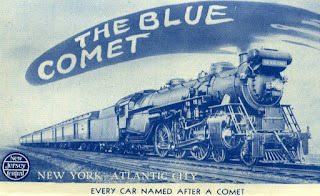 The Blue Comet would run from New York to Atlantic City, but with style that lived up to its name in appearance and engineering. Capable of traveling up to 100 miles an hour, the train was said to be the first east of the Mississippi River to use roller bearings for smooth starts and stops. White spared no expense in furnishings and design: passengers enjoyed luxurious upholstery and carpeting, fine dining and windows hand-etched with comets and stars. Each of the cars was named for a comet, including an observation car whose back deck could accommodate six travelers. The train was swathed in blue and cream colors, representing the sea and sand of the Jersey Shore, with nickel-plated accents. Even its whistle was distinctive, with Pinelands residents recalling a foghorn- or steamboat-like tone. When the Blue Comet made its maiden trip in February 1929, it became CRRNJ's flagship train. Its introduction was ill-timed. Eight months later, the stock market crash plunged the nation into the Great Depression, leaving most potential travelers without the resources for luxury travel. By 1933, the train was making just one run a day, and competition from the Pennsylvania Railroad took additional ridership away. However, the Blue Comet soldiered on, logging an on-time record so reliable that people along the route set their clocks by the train's arrival. Legend has it that the people of Chatsworth counted on the northbound train to slow enough to drop off the New York and Philadelphia newspapers that passengers had read and discarded. In fact, Chatsworth was little more than a brief blip of scenery to the Blue Comet until August 19, 1939. More than a foot of rain fell during a tremendous storm that day, with cloudbursts delivering the vast majority of it after 2:00 p.m. Poor visibility forced the train's crew to reduce speed to about 40 miles an hour, but restricted sightlines were just part of the danger ahead. By 4:30, flooding had washed the sandy Pinelands soil out from beneath the tracks at milepost 86, about a mile west of Chatsworth. The train's crew had no idea of the hazard they were approaching. Though the locomotive and coal tender made it over the now-unsupported track, the five passenger cars separated and came off the rails, resting at angles nearly parallel to the railbed. Despite crashing in the sparsely-populated Pinelands, help wasn't long in coming. Realizing that the ever-reliable Blue Comet was late to the station, the concerned people of Chatsworth waded to the scene of the crash. Word went out that 100 or more souls could have died in the crash, drawing ambulances and doctors from distant communities. Of the 49 souls on board, 38 suffered mostly minor injuries, though the train's cook was fatally crushed and scalded when the dining car stove fell on him.The crash scene was so flooded that local residents later recalled wading through chest-deep water to help passengers in the train's last two cars. The track was quickly repaired and service restored after most of the Blue Comet's cars were reconditioned, but the flagship train's days were numbered. Just over two years later, it made its final run, never having made much of a profit, if any, for the Jersey Central. After finding the brief bit of track commemorated in downtown Chatsworth, we headed east on a road alongside the old railbed. The area may have become more developed over the years, but it wasn't hard to imagine what residents might have faced as they attempted to help the Blue Comet's passengers after the derailment. The track runs pin-straight for what seems like miles, often on berms of that classically-sandy Pinelands soil. 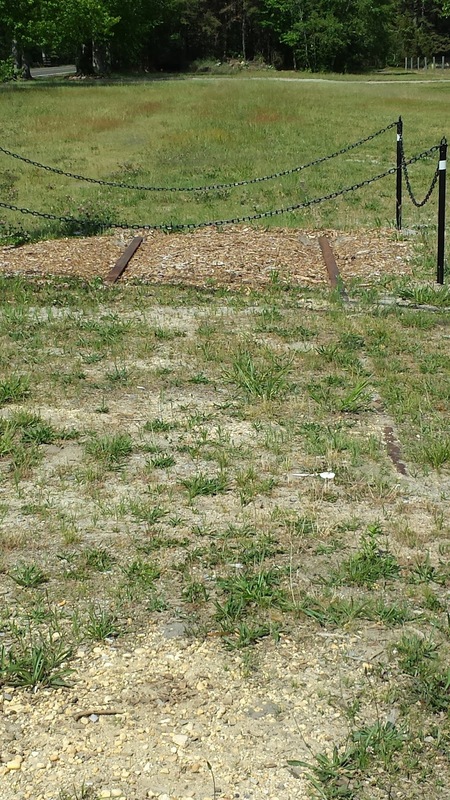 Portions of the track were obscured by overgrown weeds and trees that had sprouted between the rails. Other stretches seemed to be clear enough to accept a train on a moment's notice. Someone with a good imagination could stand there at night and will herself to hear the roar of the Blue Comet, its foghorn whistle alerting local residents of its approach. 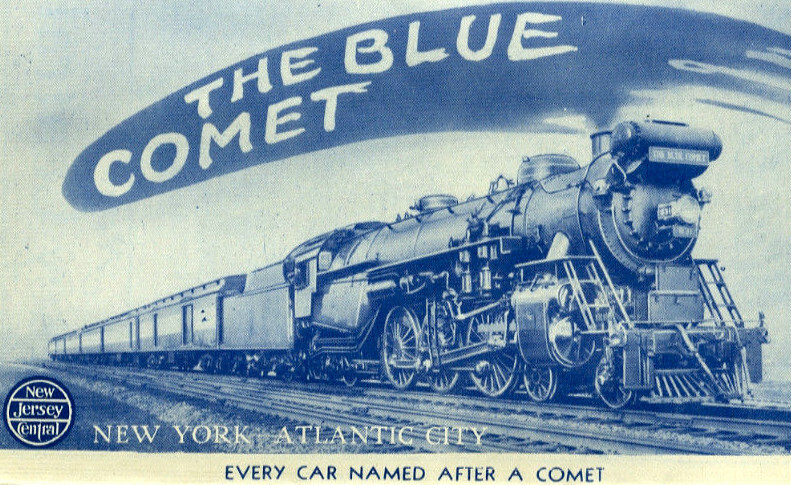 As seems to be the case with so many legendary trains, bits and pieces of the Blue Comet are still out there for the finding, with four complete cars still in New Jersey. One car, Biela, stands near Route 22 West, having been converted to a dining room at the Clinton Station Diner. Another three are owned by the United Railroad Historical Society of New Jersey, with plans for restoration and eventual return to the tracks. Sopranos fans might also remember the train's fateful appearance on one of the series' final season installments. Model railroad aficionado (and Tony Soprano's brother in law) Bobby Baccalieri is admiring an antique Lionel Train version of the Blue Comet when he's dispatched by two hitmen from a rival crime family. Perhaps the show's producers didn't resolve the story of the famed Russian of the Pine Barrens episode, but ironically, someone in Tony's crew received a Pinelands-related payback of sorts. Ever have one of those days when your work brings you onto the road a little earlier than usual, the weather is clear and balmy and you find yourself driving near one of your favorite places? The coincidence is just too good to pass up a visit. It doesn't seem to happen often enough, but that's where I was this afternoon. Near perfect weather, assignments complete for the day, and deliciously close to one of my favorite birding spots, Watchung Reservation. What else could I do? With binoculars already in the car, I was ready for a leisurely afternoon hike. My usual target spot for an impromptu walk through nature at Watchung is the bridle path alongside Surprise Lake. Broad and well-worn, it's a safe, tick-free route for dog walkers, runners or folks like me who weren't exactly dressed or shod for a day in the woods. I wasn't sure I'd see or hear many interesting birds, given the time of day, but even a quiet walk is well worth the effort. 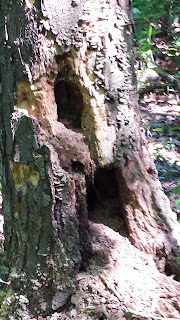 Finding my way to the bridle path, I considered trying to call out a Pileated Woodpecker. They're regulars, if not abundant, at Watchung, and we've heard and/or seen them several times near Surprise Lake, their loudly distinctive "WUK-WUK-WUK-WUK" being one of my favorite bird vocalizations. (Check it out here.) As a species, they prefer forests with a good choice of standing and fallen dead trees. Even if you're not lucky enough to see one, you'll probably see evidence of them in a decent-sized woods -- large chunks of bark and inner tree trunk laying on the ground where they've pecked for insects. Square-shaped holes mark where they've excavated nesting holes. You may be wondering what the big deal is about Pileated Woodpeckers. Quite simply put, they're huge, and they look like an old school Woody Woodpecker. At an average of 16 inches long, with a large, powerful bill and distinctive red crest, they're more than twice as big as the Downy Woodpeckers you might see on a backyard tree. And rather than drilling in a rapid-fire pecking motion, they chip rather deliberately at their target tree trunks, cocking their heads as if contemplating the perfect angle to get to the inects beneath. Just as I was thinking about imitating the "WUK-WUK-WUK" to bring one out, I saw movement at the base of a tree on the side of the trail about 10 feet ahead. Expecting to see a Robin or two, I was astounded to see two Pileateds low on the tree trunk. It was clear they'd been there a while: one was standing on a pile of wood chips it had clearly excavated from the large hole it was still pecking away at. If I didn't know better, I'd believe it was a contractor working on a new factory for the Keebler Elves. The companion Pileated seemed either to be standing watch or perhaps waiting for a few good morsels exposed by its more industrious partner. Was this a parent-child situation, with a hungry adolescent waiting for mom to provide dinner? Whatever their work plan and relationship, they made for fascinating watching. My plans to go any further down the trail evaporated instantly as I set to watch one of my favorite species from the closest vantage point I'd ever had. It's not often you can view woodpeckers situated closer to the ground than you are! As the excavator continued his work, the other bird alternately turned up bits of piled detritus or hid around the side of the tree, his head occasionally popping up in a somewhat startled-looking "peekaboo" fashion. Then, suddenly, I heard the "WUK-WUK-WUK" sound of a third Pileated from a tree about 10 feet beyond the working pair. Seeing two at once was a treat -- three was unprecedented for me. Could this have been the other parent, or maybe another offspring? Was it possible that there were even more in the vicinity? I stayed just a few more minutes to enjoy the activity, then left the apparent family to their dinner. It wasn't clear they'd even noticed me, but they deserved their privacy and a measure of safety. And besides, they were making such short work of that hole at the base of the tree that I couldn't be sure it wouldn't come tumbling down at some point. * For a spur-of-the-moment stop at the Reservation, I'd been nourished by a peek at nature that I won't soon forget. *I kid, I kid. To my knowledge, no tree has ever been felled, beaver-style, by an overenthusiastic Pileated Woodpecker. New Jersey isn't especially known for its wide open prairies, ranches and cowboys. According to some, though, Salem County just may have been the sight of the nation's first cattle drive. And no, I'm not talking about a Saturday night rodeo in Cowtown, though the historic drive took place nearby, led by a brigadier general known as Mad Anthony Wayne. Venture back to early 1778, when General George Washington's army was encamped at Valley Forge, Pennsylvania. Beset by desertions by February, Washington still had to feed more than 2000 men, as well as the horses they relied upon, even as the British conducted their own foraging expeditions and dealings with help from sympathetic Pennsylvanians. This specimen would have fed a LOT of Continental soldiers. Across the Delaware River was New Jersey, known as the Breadbasket of the Revolution for its plentiful forage for animals and food for humans. Washington sent Wayne with about 550 troops down Jersey to Salem County to retrieve the life-sustaining supplies. Starting from Wilmington, Delaware to avoid the British-controlled river near Philadelphia, Wayne and his troops made their way to Salem and to the area near present-day Pilesgrove, where they gathered about 150 head of cattle. Horses and wagons, however, were in short supply, meaning that the Continentals would have to drive the cattle on the hoof back to Valley Forge, rather than transporting butchered beef. By this point, a local Loyalist had tipped off the British and more than 2000 Redcoats were sent to track Wayne and his troops down. 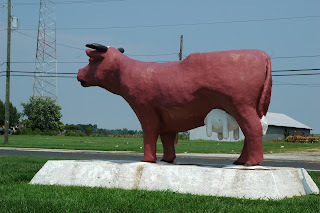 After an initial stab at transporting some of the cattle to New Castle, Delaware to evade the British, Wayne led the procession northward and west along the Old Kings Highway on the 50 mile journey to Valley Forge, eventually crossing the river north of Philadelphia, somewhere between Burlington and Trenton. While some say that the herd was diminished to a mere 50 head by the time Wayne reached camp, the Jersey beef and hides undoubtedly made the difference for countless hungry and shoeless Continental soldiers. The Great Cow Chase, as it's now known Down Jersey, has been commemorated a few times in recent years. Back during the Bicentennial, Cowtown founder Stoney Harris and friends drove 50 cattle up Kings Highway, with cheering spectators lining the road. And last year marked the first running of the Cow Run 10 Miler road race for humans, starting at Cowtown in Pilesgrove and ending 10 miles away in downtown Salem City. It may not be the running of the bulls, but it's a truly unique way of celebrating a little-known yet important part of our Revolutionary history!